Last Tuesday evening I drove to Center to address the Shelby County Historical Society. Monthly meetings are held in the Shelby County Museum, a couple of blocks northeast of the courthouse square. The museum houses a nice collection of artifacts and photos, as well as excellent archival files of county history, individuals and genealogy. I've presented programs to the Society several times through the years, and this time I was asked to speak about "Texas Women." From the 19th century I selected a succession of frontier women, who proved the old adage that "Texas is hell on horses and women." I tried to stress the isolation, hardships, and dangers faced by hardy, courageous women of the Texas frontier. The 20th century women I discussed were Margie Neal, the first woman to serve in the Texas Senate; Governor Miriam A. Ferguson; Colonel Oveta Culp Hobby, who was asked to form the Women's Army Corps ("I never did learn to salute"); and Governor Ann Richards. students to the book signing on the square. Two days later I returned to Center. Ann Bowen, an officer of the Shelby County Historical Society, owns and manages an antique mall and had advertised a book signing schedule from 10 AM to 1 PM, featuring my two new titles, West Texas Cattle Kingdom and Lampasas, 1855-1895, Biography of a Frontier Texas Town. There was an excellent turnout which included a number of my former students, and the three-hour signing turned into four hours. Two days later, on Saturday, my wife Karon and I drove toward Austin, with a stop in Corsicana to see the Easter cycle play which I described in the previous blog. A crowd of more than 300 followed the "cycle" from one church to another, and a large chorus and instrumentalists maintained the mood of the pageant as we moved to different stations. The scenes were carried off with imagination and power, and I learned that on the next day, Palm Sunday, the crowd was even larger. My wife and I spent Saturday night at the Stagecoach Inn in historic Salado. I was scheduled to speak at the Bob Bullock Texas State History Museum early Sunday afternoon. We arrived with time to spare. I checked in at the gift shop, which had planned a signing for my most recent book, West Texas Cattle Kingdom. Esther Rivera of the museum staff took me to the Texas Spirit Theater for a sound check with the technicians. As the audience arrived I greeted as many as possible, expressing my appreciation for their attendance. I was delighted to see a former student, Wade Parsons, who had brought his family. My oldest daughter, Lynn Martinez, a teacher in the Mansfield ISD, also was present with her family, husband Rudy and daughters Chloe and Jessie. Lynn had hoped for years to bring her daughters to the Bob Bullock Museum, and I was proud that they were able to coordinate the museum visit with my appearance. I was introduced by the museum director, Joan Marshall, who had invited me to prepare an address on "The Leadership Roles of Sam Houston." I relished this assignment, and the audience seemed quite receptive. There was a brisk book signing afterward, and I was deeply privileged to have been asked to provide an event at the flagship museum of Texas History. The following evening I again was in Center to provide a program for the Capt. Jesse Amason Camp, #282, of the Sons of Confederate Veterans. There are 80 camps, or companies, of the Texas Division of the SCV. Three of my great-grandfathers defended their homes - in Georgia, Mississippi, and Alabama - as youthful soldiers of the Confederacy, and they each migrated to Texas after the Civil War. I had met with the Center SCV on past occasions, and it was a pleasant evening for me. As I drove home afterward, I reflected on what a busy and rewarding week it had been, full of State Historian activities, with more around the corner. Dr. Shellie O'Neal, director of he Theatre Department at Navarro College in Corsicana, has utilized her skills and training as a dramatist to create historical theater. Shellie, one of my daughters, was a faculty member at the University of Texas in Tyler when, in 2001, she was selected to revive Navarro's Theatre Department, which had been discontinued years earlier. Because her budget was limited, she began to write her own plays to avoid the royalties required for published plays. Through the years she has written, produced directed, and occasionally acted in more than 20 plays. Shellie has created comedies, romances, children's plays, and religious plays. Some of her work has a Texas setting, such as Love in Lampasas, and Bluebonnets in the Back Yard, set in Nacogdoches County. Hope in Hemphill won the Texas State Playwriting Award of the Texas Educational Theater Association. Traveling the Gnome Star State is a children's play in which a band of gnomes make their way across Texas encountering longhorns, bluebonnets, mockingbirds, and other icons of the Lone Star State. For several years Dr. O'Neal has researched medieval cycle plays, including work in England. While cycle plays remain popular in England and Canada, there is no record of a cycle play ever having been performed in Texas. On Palm Sunday weekend, the Navarro College Theatre Department will present Clothed in Glory: A Palm Sunday Pageant, written and directed by Dr. O'Neal. Her students have constructed two medieval-style pageant wagons, and numerous costumes have been assembled. The cast is composed of Navarro students and faculty members. Within an area of a few blocks in Corsicana, four churches form a rectangle. Shellie consulted with each of the four pastors of these churches, and an appeal was made to the church choirs. The pageant will begin at the ornate 1896 First Methodist Church, then will proceed to the nearby First Presbyterian Church, where scenes from the life of Jesus will be portrayed by 43 cast members, 34 members of the combined choir, and assorted sheep and horses. The crucifixion will be dramatized at St. John's Episcopal Church, and the resurrection scene will take place across the street at the First Baptist Church. There has been enthusiastic support from Navarro College, the four churches, and the community, and this unique event is widely anticipated. Performances will begin at 3 PM on Saturday, March 23, and the next afternoon, Palm Sunday. 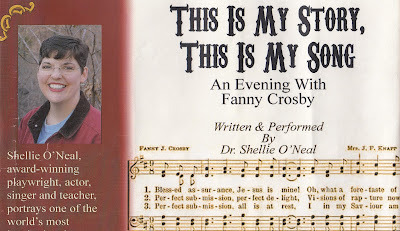 Shellie's other major venture into historical drama is a one-woman play about Fannie J. Crosby, the blind composer of more than 8,000 hymns. Shellie approached the project with the methods of an historian. She read and noted Crosby's two autobiographies, her hymns, and her nine biographies. She conducted primary research in New York City, the site of Crosby's home life. Shellie first performed the play in November 2011, and numerous appearances since have included two performances in New York. 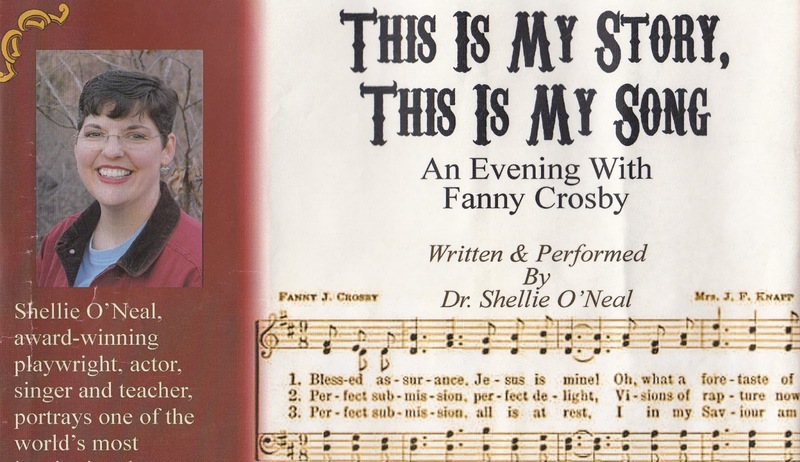 This is My Story, This is My Song: An Evening With Fannie Crosby features several of Crosby's most beloved hymns, and Shellie will next perform as Fannie on Sunday evening, April 7, at the First Baptist Church of Graham. I proudly provide whenever possible. 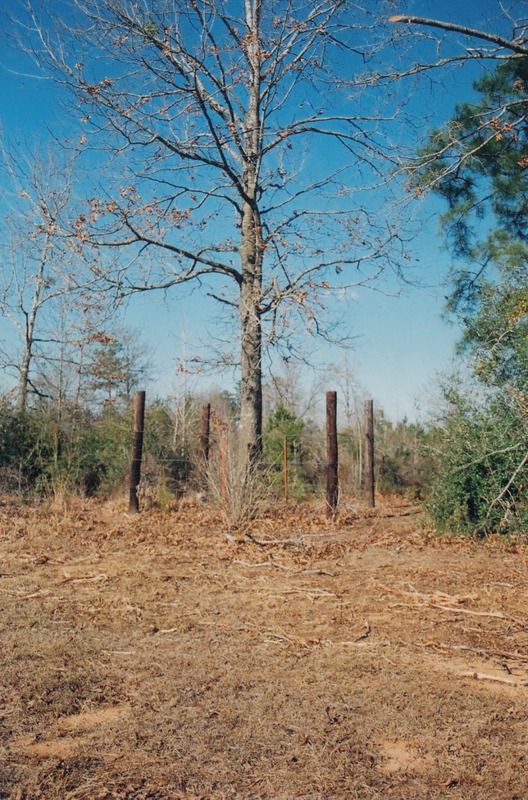 The only original boundary marker in the contiguous United States stands in southeastern Panola County. On June 1, 1840, the steamboat Albert Gallatin stopped its northbound journey up the Sabine River at Logan's Ferry (later Logansport). Passengers included a commissioner and a surveyor from the United States, and a commissioner and a surveyor from the Republic of Texas. These men were setting the border between the United States and the Republic of Texas from the Gulf of Mexico to the Red River. 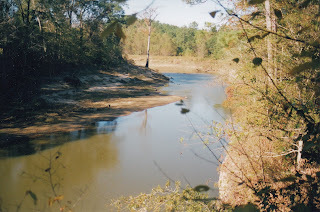 The southern part of the boundary was the Sabine River, but just above Logan's Ferry the river turned toward the northwest. At this turning point a meridian line was surveyed northward to the Red River, and a granite marker was placed on the north-south meridian. One side of the marker has the letters "R.T.," while another side announced, "Meridn [sic] Boundary Established AD 1840." (A larger marker - ten feet tall - at the nearby Sabine River has been lost to erosion.) This unique historical artifact may be found in a small park on the north side of Highway 31 below the rural community of Galloway. Pulaski, the seat of Panola District, was about 12 miles to the northeast of the boundary marker, perched on a bluff overlooking the east bank of the Sabine River. A river ferry just to the north gave birth to the log cabin village. The log structures of Pulaski were arranged in a rough triangle, and included a one-room log courthouse. When Harrison County was organized in 1839, Pulaski served as the seat of government until 1841, when Marshall was founded as county seat. Panola District became Panola County in 1846, and Pulaski was the first county seat, until Carthage was founded near the center of the county in 1848. No trace of Pulaski remains today, except the roadway and ferry site. The deserted townsite is on private property and is difficult to reach. beside the marker to provide size perspective. 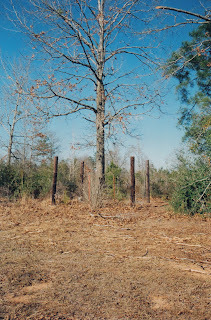 Another nearby relic of the Republic of Texas is a private cemetery located about five miles southwest of the international boundary and less than a mile inside Panola County's southern boundary. The Regulator-Moderator War was a blood feud that swept across Harrison County, Panola District, and Shelby County during the 1840s. There were almost 40 deaths, and the murderous leader of the Regulators was "Colonel" Watt Moorman. Moorman was slain with a shotgun blast, and he was buried in a family cemetery that is today bounded by four posts. A former student of mine at Panola College graciously permitted me access to this venerable cemetery. down to the east bank and a ferry. cemetery has ten unmarked graves. Sabine River at the location of this modern traffic bridge. side to the point where I am standing with my camera. by an intended victim, Dr. Robert Burns. Fort Worth was the recent site of the 117th Annual Meeting of the state's oldest scholarly organization, the Texas State Historical Association. The Worthington Renaissance Hotel, across from lively Sundance Square and one block south of the historic Tarrant County Courthouse, provided the TSHA with hospitality and spacious facilities. From Thursday through Saturday, February 28 through March 2, more than 670 attendees enjoyed a buffet of historical activities. A large number of exhibitors and benefactors provided $32,000 in sponsorships, helping the TSHA to stage program sessions and events honoring and celebrating the incomparable historical heritage of the Lone Star State. Press during the Annual Meeting. "New Perspectives on Texas Soldiers in WW 1." Women and the Texas Revolution. There were 42 sessions, each offering two or three presentations and the latest research from an impressive gathering of scholars and authors. Other activities included a Women in Texas Luncheon, a Book Lovers' and Texana Collectors' Breakfast, an Awards Luncheon, a Graduate Student Mixer, the Presidential Banquet honoring outgoing TSHA President Watson C. Arnold, and field trips to the historical delights of Cowtown. Adding to the historical variety were sessions provided by the Texas Folklore Society, Texas Historical Commission, Texas Archaeological Society, Texas Catholic Historical Society, Texas Oral History Association, Texas Supreme Court Historical Society, and the Society of Southwest Archivists. There were several book signings with the authors of exciting new releases. The most accomplished history professors in Texas were present, and so were successful businessmen, lawyers, doctors, librarians, dedicated public school teachers - all with a passion for Texas history and a determination to perpetuate the TSHA and other organizations devoted to the study and promotion of elements of the rich tapestry of the history of the Lone Star State. At these annual meetings it is a delight to encounter old friends and kindred spirits, and to meet new individuals who are steeped in Texas history. We left Fort Worth already looking forward to the 118th Annual Meeting in San Antonio. The TSHA Education Committee met on Friday morning. the Major looks over his shoulder. Peter B. Rose (left) and Rick Miller. chief historian for the TSHA. a Fellow of the TSHA. a descendant of Stephen F.